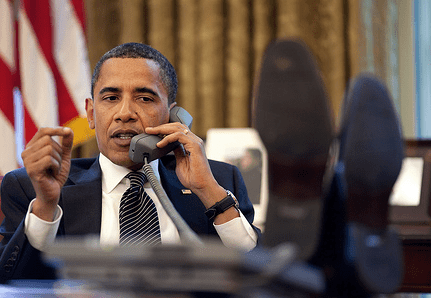 Did the State Department leak a phone call in which Obama insists that Israel unilaterally stop its surge into Gaza? The Times of Israel has published what is alleged to be a transcript of a leaked telephone call between Obama and Netanyahu. Both Netanyahu and Obama are denying its truth, but I wonder. The substance is entirely consistent with Obama’s and Kerry’s public pronouncements, although much ruder, hectoring, hostile, and autocratic in tone. My suspicion is that Obama is denying it because he’s worried that it makes him look bad, and Bibi is denying it for the same reason — to help Obama save face in return for which, one hopes, Bibi gets something. Israel’s Channel 1 publishes a Hebrew transcript of a portion of Prime Minister Benjamin Netanyahu and US President Barack Obama’s telephone conversation Sunday, in which Obama is insistent that Israel unilaterally halt all military activities in the Gaza Strip.